10.2?? Nambucca Shire Traffic Committee Meeting Minutes - 5 April 2011 ???? Planning is underway to update and then test Council?s disaster recovery and business continuity plan. No response from Minister for Planning as at 22/2/11. No response from Minister for Planning as at 28/3/11. New round of letters sent by weekending 21 April 2011. Council?s solicitor, Terry Perkins has been instructed to act on Council?s behalf in pursuing the claim. GM met with PWD representatives on 2 March.? Verbal agreement has been reached on a $48,000 settlement being the foregone subsidy on the additional work.? PWD to put in writing to Council. CPG have advised that UBS CMT, is a Managed Fund and that Council staff were correct in their assumption that the account, albeit that it is a settlement account, would be in breach of the Ministers? Orders.? UBS have advised they have a cash account facility that is not a managed fund and pays higher interest rates than the existing UBS CMT account.? To utilise the ?cash account? a Council needs to maintain a balance of $250,000 for 3 days to meet the wholesale client test.? UBS to provide further details. Council staff have now withdrawn funds from the UBS CMT and are establishing a new cash management at call account, possibly with the ANZ bank.? Interest rates being checked before a final decision is made. IPR current priority. Deferred to March 2011. IPR and reformatting of Management Plan remain priorities.? Have had to defer again to April 2011. Now May 2011. Letter written to LPMA 26 November 2010.? Meeting with LPMA and Committee of Management arranged for 27/1/2011. Meeting held on 27/1/2011.? Awaiting advice from LPMA on bringing more crown land into the reserve and grant opportunities. To come with quarterly budget review. Letters sent on 10 December 2010. Responses received from 2 of 3 Committees of Management.? Information from 3rd Committee has been followed up. To be reported in April 2011. Signs unable to be erected prior to Christmas.? Report deferred to April 2011. Report further deferred to after April school holidays. Council write to Country Energy asking if electricity cables can be bundled in River Street to reduce pruning as a community service. Letter sent 9 February 2011. Response received from Country Energy advising that the matter is being investigated. Council?s Strategic Planner prepare a Climate Change Adaptation Policy for future adoption by Council to ensure that actions contained in the Climate Change Adaptation Strategy are given consideration in future decision making, policy implementation, strategy development & Council staff. Due to workloads this report has been deferred ? now likely to be May 2011. Council write to RFS Commissioner re undertaking that increases in RFS contributions would be subject to review by IPART. Council defer demolition of the old rugby league amenities at Coronation Park for a period of 3 months to allow the Trust to complete their proposal to restore parts of the building and to demonstrate their ability to fund the project. Paveline patching machine ? a further report be prepared of the year July 2010 to June 2011 for comparison with the same period in the previous year. Council liaise with the Saltwater Freshwater Festival Committee with a view to conducting the Festival in the Nambucca Valley in 2013. Letter sent to Committee on 21 February 2011. Council write to the relevant Minister and Federal Government Department concerned with pest control seeking a more active approach to the control of the Indian Myna and requesting that it be officially declared as a pest. Letters sent 3 March 2011. Council write to the Minister for Roads requesting an immediate decision on the total reconstruction of the Bowraville to Bellingen Road. Council request the RTA to provide a breakdown of the $10m expenditure on safety improvements to the Pacific Highway between Urunga and Nambucca Heads. Council be provided with a report on other councils? (Mid North Coast Group of Councils) garbage services inclusive of waste management processes, environmental outcomes and the rate per annum. Council write to CHCC requesting the audit report (on biomass solutions) as soon as it?s received and request a presentation on the 3 options with the opportunity to comment before CHCC determines their position.? Copy of letter to go to Bellingen SC. Further concept plans on the River Street foreshore redevelopment be prepared for Council?s consideration. Council approach the Minister for Roads and the Local Member to request Taylors Arm Road, MR533 be reinstated as a Regional Road. Council commence the formal procedure to rename the Congarinni Bridge the, ?Howard ?Pud? Langford? bridge. Council receive a report on options for addressing waste disposal for the residents of Burrapine.? One of the options to be considered is a waste transfer station. A report to come back to Council on the terms of reference for an Economic Directions Committee, including its role, selection of members, frequency of meeting, voting arrangements and any delegations of authority. Council request the RTA to conduct a safety review of the Pacific Highway between Eungai and Nambucca Heads with a view to undertaking interim safety works including consideration of speed zones and speed cameras.? Council seek the support of its Local Member and Deputy Premier to the request. That a Committee be formed comprising the Mayor, library delegates, MCCS to investigate the possibility of forming a relationship with other local Council libraries and that the Committee report back to Council by Feb 2012. Council write to the Clarence Valley Council asking what they anticipate future contributions to the Clarence Regional Library will be when the Strategic Plan has been completed and the planned outcomes achieved. That the GM report on the options for the use of the funds in the S94 reserve for public recreation in the Macksville/Scotts Head catchment including foreshore redevelopment at River Street, Macksville. That Council request a presentation from the Executive of the Mid North Weight of Loads Group at a GPC meeting. The total return on investments from 1 July to 31 March 2011 is $1,283,746.00. During March, Term Deposit interest rates ranged from 5.74% for 30 days and up to 6.64% for 12 months. Council placed three Term Deposits during the month between 210 and 1832 days with interest rates from 5.98% to 7.15%. ?????????????? TCorp - balance $979,260 positive return $2,372. Council currently has $6.50 Million with Managed Funds and the balance of $26.679 Million on term deposits. ?????????????? This report details all the investments placed during March and Council funds invested as at 31 March 2011. That the Accountants? Report on Investments placed to 31 March 2011 be noted. This report details all the investments placed during March 2011 and Council funds invested as at 31 March 2011.
? Unrealised losses were added back in previous investment reports. That Council may not meet its budget returns for 2010/2011 based on current performance. A review of budgeted interest returns for 2010/2011 was completed with the December Budget Review and GPG Research & Advisory provided Council with the updated interest rates. Interest on investments was assessed with the December 2010 Budget Review.? Variances have been distributed between the Water, Sewerage and General Funds for the first and second quarter of the financial year. It will be noted from the report on investments in this business paper that Council has $6.5m with managed funds and $26.679m in term deposits generally with maturity dates of less than 12 months.? The only exception is a $1m term deposit recently taken out with Rabobank for a term of 5 years at an interest rate of 7.15%.? Council is continuing to receive advice from its investment adviser, CPG Research and Advisory urging that we further diversify our investment portfolio in term deposits away from short term deposits. Their concern is that if we don?t lock in a proportion of longer dated securities we will be more exposed to potential weaknesses in the cash rate in the event of a deteriorating economic environment eg anaemic domestic growth, or further shocks at home or abroad including the oft discussed double dip recession. In lieu of the resolution of Council from February 2010 it is recommended that the General Manager and in turn finance staff be provided with delegated authority to invest in longer dated term deposits being terms of up to 5 years provided the total portfolio exceeding 2 years is not more than $5m.? Further, any decision to invest in longer dated term deposits is only to be made in accordance with advice from CPG Advisory. Subject to compliance with Ministerial Directions, Council has discretion as to the structure of its investment portfolio.? However it is prudent to accept the advice of our professional investment adviser, CPG Research and Advisory. Typically interest rates for the short dated term deposits are less than 6.5%.? In the event that the cash rate falls, Council will have significant exposure to a loss of investment income as its $25.679m is rolled over at lower interest rates.? Whilst no one knows whether the cash rate will fall, prudent risk management would suggest that we should hedge against this possibility, particularly where there is a reasonable interest premium for the longer dated securities. Council is continuing to receive advice from its investment adviser, CPG Research and Advisory urging that we further diversify our investment portfolio in term deposits away from short term deposits for the reason discussed above.? Their concern is that if we don?t lock in a proportion of longer dated securities we will be more exposed to potential weaknesses in the cash rate in the event of a deteriorating economic environment eg anaemic domestic growth, or further shocks at home or abroad such as a hiccup in China. Strategically, CPG draw attention to the 15 month period that fixed interest rates collapsed during the GFC (from July 2008 to October 2009).? Term deposits of more than 18 months would provide Council with significant protection against income risks in a period of economic weakness.? Also given current interest rates it is difficult to see a downside in longer dated securities as they are providing a better return as well as reducing risk. Our investment advisers encourage Council to continue to take advantage of the term deposit premium which is on offer for longer dated securities.? They believe that the current spread in interest rates will narrow in the foreseeable future. ?that finance staff be advised not to invest deposits for three to five years and that any long term investment be reported to Council prior to investing?. There is usually insufficient time to report to Council on an opportunity for securing favourable interest rates for longer dated term deposits.? Typically such investment decisions have to be made within 48 hours based on a recommendation from CPG.? Council?s accountant also has to take into consideration the requirement for cash over the term of the deposit. There has been consultation with Council?s accountant and CPG Advisory. The report is concerned with minimising the risk to returns from Council?s investment portfolio. At this stage there is no implication on Council?s budget.? Should there be a decline in the cash rate, Council will have a significant exposure to the loss of investment income when those term deposits are rolled over. 1????????? That Council note the progress of DA2004/136. 2????????? That the remaining outstanding development applications (at least 12 months old) and applications received, be noted and received for information by Council. 3????????? That the applications where submissions have been received be noted and received for information by Council. Bushfire Safety Authority from the RFS provided to Council by letter dated 07/03/2011. See Report prepared for GPC of 20/04/2011. Awaiting additional information from applicant in relation to flora and fauna, stormwater drainage and flooding. 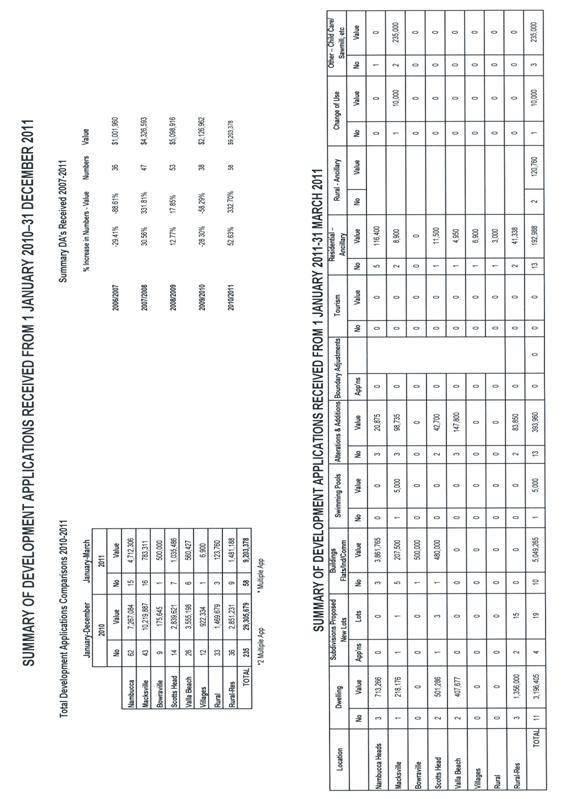 Environment and Planning Department Development Application statistics for the financial year 2010-2011 compared with 2009-2010 and Certificate Applications received and determined are provided in the body of the report. 2????????? That Council note Occupational Certificate released for the years 2004 to 2011. 3????????? That Council note the statistical information for Applications and Certificates received by Council for 2004-2011. 4????????? That Council note the statistical breakdown of development applications thus far for the current year beginning 1 January 2011. The figures show a 4.71% increase in the number of DA?s received to March 2011 with construction costs increasing by 53.54% compared to the same period in 2009/2010. The total number of DA?s/CD?s approved for the month of March was 17 plus 5 modifications. The following is the Contract Regulatory Officer?s Report for March 2011. Attached for Council?s consideration are the minutes of the Nambucca Shire Council Access Committee meeting held 22 March 2011. The meeting included the Annual General Meeting and election of office bearers. Peter Shales (Chairperson), Shirley Holmes (Deputy Chair), Fiona Holmes (Secretary) and Committee members Margaret Hutchinson, Alba Sky, Mathew Sullivan, Les Small, Keith Davis and Dorothy Secomb; with Council?s delegates being Councillors Smyth and South. That following the success of the Planning for the Future: Focus on Seniors and Access discussion held today, that a similar discussion be held in Seniors Week 2012 as this should fit with Council?s timetable for consultation on its draft 10-year Community Strategic Plan. That Council write to the Banana Coast Credit Union regarding access issues and the step at its ATM in Bowra Street Nambucca Heads; and to the appropriate authority regarding subsidence next to the V-Wall footpath Nambucca Heads near the lagoon seawater pipe. 1????????? That Council endorse the office bearers and members of the Access Committee listed as follows: Peter Shales (Chairperson), Shirley Holmes (Deputy Chair), Fiona Holmes (Secretary) and Committee members Margaret Hutchinson, Alba Sky, Mathew Sullivan, Les Small, Keith Davis and Dorothy Secomb; with Council?s delegates being Councillors Smyth and South. 2????????? That following the success of the Planning for the Future: Focus on Seniors and Access discussion held 22 March 2011, that a similar discussion be held in Seniors Week 2012 as this should fit with Council?s timetable for consultation on its draft 10-year Community Strategic Plan. 3????????? That the Access Committee?s concerns regarding the access barrier at the new Bananacoast Credit Union branch in Bowra Street, Nambucca Heads be brought to the attention of the BCU Management. 4????????? That the matter of subsidence at Nambucca Heads Public Recreation (R81262) Reserve Trust alongside the V-Wall footpath and adjacent to the Lagoon seawater pipe be referred to Council?s Engineering staff for their assessment and appropriate action. The Access Committee members will review the results of the discussion to ensure that they reflect the outcomes of the day and from there a report will be prepared for Council together with the results of the various other Community Engagement forums. The success of this discussion appears to have been largely due to seniors being able to put forward their views in their own language and amongst their peers. The Access Committee is supporting the feedback from the day that this type of discussion would be a useful exercise in the future. Whether it would coincide with Seniors Week 2012 and Council?s consultation period on the Community Strategic Plan will depend on the actual timing of both, however the concept has merit. Note: Providers of services to seniors and people with disabilities will have a choice of opportunities to have input into the Strategic Plan, including a specific community services forum. The Bananacoast Credit Union branch and its ATM in Nambucca Heads has recently been relocated to a site in Bowra Street. The building is fronted by a tiled terrace-type area which has a small step up from the footpath, however this step is significant enough to create an access barrier for someone who uses a wheelchair. The Access Committee has been asked to act as an advocate in this matter and bring this to the attention of the BCU. It is believed that a number of BCU members have also raised the same concern. Council?s Property Officer advises that this area is Nambucca Heads Public Recreation Reserve Trust (R81262), that Council is the Reserve Trust Manager and ultimately responsible for any upkeep to the Reserve. Council staff are best placed to make an assessment of the area and to determine what recommended action is necessary. Identification of hazards underpins good risk management. That the Committee confirm the Minutes of the Meeting held 22 February 2011. That Council endorse the office bearers and members of the Access Committee listed as follows: Peter Shales (Chairperson), Shirley Holmes (Deputy Chair), Fiona Holmes (Secretary) and Committee members, Margaret Hutchinson, Alba Sky, Mathew Sullivan, Les Small, Keith Davis and Dorothy Secomb; with Council?s delegates being Councillors Smyth and South. Note: The Committee confirmed that meetings would continue on the 4th Tuesday monthly at 2pm at the Council Administration Centre. The Committee noted a report from Peter Shales following his attendance at the Coffs Coast Disability Advisory Committee. That the items of correspondence be noted. 1????????? That following the success of the Planning for the Future: Focus on Seniors and Access discussion held today, that a similar discussion be held in Seniors Week 2012 as this should fit with Council?s timetable for consultation on its draft 10-year Community Strategic Plan. 2????????? That the notes from the Planning for the Future: Focus on Seniors and Access discussion be presented to the next Access Committee meeting for information. 1????????? Lack of gutter crossings around the intersection of Bellwood Drive and Pacific Highway Nambucca Heads ? possibly due to the potential for pedestrian and vehicle conflict at this busy intersection and the need to discourage pedestrian activity. 2????????? Macksville Senior Citizen?s Centre ? suggested signposting of ramp from side car park advising of step, and possible non-compliance issues with the disability toilet. 3????????? Uneven footpath and trip hazards on the footpath from Newville into the Nambucca Heads up town shopping centre. 4????????? Access problems at the High School end of the cycleway between Newville and Bellwood ? problem with tree roots. Note: Members were reminded to report potential hazards direct to Council for entry into its Customer Request System so problem areas can be prioritised for assessment and action. The next meeting will be held on 19 April 2011 (the 4th Tuesday is a public holiday) commencing at 2.00 pm noting that Cr South, Peter Shales and Alba Sky will be apologies. There being no further business the Chairperson then closed the meeting the time being 3.25 pm. Proposal:????????????????????? Community Title subdivision comprising one neighbourhood lot, 5 rural residential ???????????????????????????????????? development lots and a residue rural lot. Zoning:????????????????????????? Part Rural (1a2) & part Rural (1a1) ? Rural-Residential under NLEP 1995 and part R5 (Large Lot Residential) & part RU2 (Rural Landscape) under NLEP 2010. The original application for a rural-residential subdivision has been amended on several occasions. The last amendment for a Community Title subdivision, comprising one neighbourhood lot, 5 rural-residential development lots and a residue rural lot, was considered by Council at its meeting on 21 August 2008. Council resolved to conditionally approve the application; however, a subsequent third party appeal against Council's determination of the application was successful. Council is advised that the judgement handed down by the Court made no orders and therefore determination of the application is still pending. The application is submitted to Council for it to make a final determination of the proposed development. Only two of the five challenges to the validity of the development application were successful. The first related to a failure to address mandatory relevant considerations. This failure related to consideration of Clause 13 under NLEP 1995 and consideration of all submissions lodged in respect of the development application. The other matter related to a failure to advertise the amended proposal. Clause 13 of NLEP 1995 has been addressed, and all submissions are attached to this report. As such, it is considered that the mandatory provisions have now been addressed in accordance with the judgement handed down by the Court. Having regard to the judicial review and Council's legal advice, it is considered that Council is now able to make a final determination of the application. 3??????? refusing consent to the application. It should be noted that if Council decides to determine the application by refusing to grant consent, Council will need to provide reasons for the refusal. c??????? the Neighbourhood Management Statement include a requirement to submit regular reports (annually) including photos which demonstrate compliance with the Koala Plan of Management, Environmental Management Plan, tree planting and maintenance program. d??????? the applicant shall make arrangements for a representative of the Nambucca Heads Local Aboriginal Land Council to be present and monitor any clearing of vegetation and whilst the soil is being turned during subdivision works. 1??????? That Development Application 2004/136 be approved subject to changes to the conditions so as to provide for a private internal road as part of the community title. 2??????? Consent for Development Application 2004/136 be granted subject to the conditions of consent attached to this report. Consent was duly issued; however, the Environmental Defender's Office Ltd (EDO) lodged a third party appeal on behalf of Nambucca Valley Conservation Association Inc (NVCA). 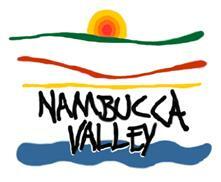 Nambucca Valley Conservation Association v Nambucca Shire Council  NSWLEC 38 or upon request from the Manager Planning and Assessment. As noted in the report, only two of the five challenges to the validity of the development application were successful. The first related to a failure to address a relevant provision in the planning instrument and the other matter related to a failure to advertise the amended proposal. With respect to the first matter, the Court held that Clause 13 under Nambucca Local Environmental Plan (NLEP) 1995 was not referred to in the report considered by Council and therefore the matter was not properly considered under the provisions of Section 79C(1)(a)(i) of the Environmental Planning and Assessment Act 1979 (EP&A Act). Similarly the Court held that the amended proposal should have been advertised and all submissions previously received should have been annexed to the report. That Council process DA 2004/136 by advertising and notifying the amended community title rural-residential subdivision and addressing all the relevant matters, including consideration of any new and previous submissions, relevant matters for consideration under Section 79C of the EP&A Act, including Clause 13 of the NLEP 1995, before final determination of the application by Council. That the applicant be advised that before Council can further consider DA 2004/136 an updated supplementary flora and fauna report is required for Council?s consideration. Such report shall address any new information not previously considered that may impact on threatened species, populations or ecological communities, or their habitats. The report should determine the significance of any such impact and if a Species Impact Statement (SIS) is required in accordance with the Threatened Species Conservation Act 1995. The applicant was advised in terms of the above by letter dated 7 April 2010. An updated flora and fauna assessment report prepared by Darkheart Eco-Consultancy dated 5 June 2010 was submitted to Council on 15 June 2010. Following a preliminary assessment of the updated flora and fauna assessment report the consultant was verbally advised that the 7 Part Test was incomplete and additional information was required to fully address all the threatened species identified in the report. Further additional information to address this issue was submitted to Council by letter dated 30 July 2010. The application was referred to: the Department of Environment Climate Change and Water (DECCW); Nambucca Heads Local Aboriginal Land Council (NHLALC); the Department of Planning (DoP); and, the NSW Rural Fire Service (RFS). The Office of Water provided its General Terms of Approval (GTA) by letter dated 30 August 2010. If the proposed development is approved, Council is required to include the GTA as conditions of any development consent granted. A copy of the letter is attached for Council?s information. The NHLALC advised Council by letter dated 16 August 2010 it does not object to the development application progressing. Notwithstanding, the NHLALC has requested that a representative be present on the site to monitor clearing of vegetation and whilst the soil is being turned. Council may wish to consider including the request for a site monitor as an additional condition of any development consent that may be granted. However, there is a standard condition that requires work to cease 'in the event of any bones, or stone artefacts, or discrete distribution of shell, being unearthed during earthworks' and the LALC and the NP&WS to be informed of the discovery.